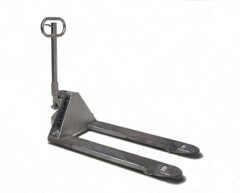 You can find a pallet truck that resists the cold temperatures of your freezer. While a standard pallet truck may not last long in the bitter cold, the exterior of this Freezer Special Pallet Truck (pallet jack) is designed to resist the corrosion caused by frequent condensation. They nylon wheels and hydraulic pump counter the effects of cold freezer environments. Freezer Pump Unit - External components are cadmium plated to protect from condensation and low temperature hydraulic fluid prevents freezing. Hot Dipped Galvanized Frame - Galvanizing process gives durable corrosion protection that stands up to the constant abrasion of pallet entry and exit. Solid Nylon Wheels and Rollers - Solid nylon provides a durable rolling surface that will not wear prematurely in applications with extreme temperature changes. Stainless Steel - The pump pistons and fork pins are critical components that require the full corrosion resistance of high quality Stainless Steel.